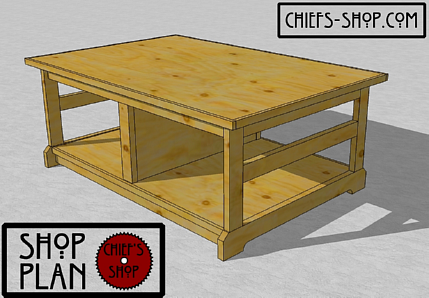 The Chief’s Shop Assembly Bench would add a large (roughly 4 x 6) work surface to your shop. It’s a bit lower than a workbench to allow you to assemble projects (hence the name) in relative comfort. A table saw/circular saw, miter saw, jigsaw, drill driver, and Kreg Jig are needed to complete it.